The Swindon bodied railcars, numbers 19 to 38. With the delivery of this series, the principal by which the Great Western operated its railcars was dramatically altered. Previously, the railcars were intended to supplement the existing steam traffic and in this they succeeded to the extent that they had to be replaced by steam-hauled trains, but after the introduction of number 18 with its trailing load, it was shown that railcars could transform a previous loss-making branch service and retain the ability to work the fast main line stopping services when required. The GWR ordered this further batch of railcars in September 1938 but with the Great Western producing the underframes, bogies, brake gear and bodies and AEC supplying the engines and transmissions for construction at Swindon. This arrangement may have come about as AEC were supplying the British Army with trucks and artillery tractors during a time of hasty rearmament. Not all cars were alike as numbers 19 to 33 were intended for branch-line working, number 34 was to be a second express parcels car, while numbers 35 to 38 were designed as twin-sets with buffets and toilets for working the Birmingham to Cardiff service. 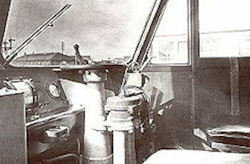 Although number 18 had given invaluable experience as a railcar with a trailing load, the design of this group of 20 cars was a major departure from previous models. On the mechanical side, the engine bore size was increased from 115 mm to 120 mm although maximum power output was reduced by regulation from the earlier 130 bhp to 105 bhp. AEC direct fuel injection was used to give maximum possible fuel economy. The radiators were resited between the engine and the gearbox giving space for an additional fuel tank on each side. The radiator cooling arrangement was quite novel in that two fans were mounted on the shaft connecting the engine and gearbox with everything contained within a seperate housing. Additionally, the positioning of the engines reverted back to a staggered situation to overcome the excessive body sway suffered by number 18. Using the same bogie dimensions as number 18 of 8 feet 6 inches wheelbase and 43 feet 6 inches bogie centres, the main difference was the use of 38 inch diameter wheels against the preceding 37 inches diameter. The most obvious deviation from the design of the earlier cars was the Swindon built body which used straight lines and flat panels against the previous curves and rounded surfaces. This was most noticable on the near vertical area at the lower part of the cab, although this new design added 3 feet to the overall length of the railcar. With aseating capacity for 48 passengers, the saloons were finished in coloured rexine and polished mahogony mouldings with seating in a patterned olive green moquette. Number 20 was the first car to be taken into GWR stock on the 4th of June 1940 followed by numbers 19 and 21 on the 11th of July. Specifications of GWR Railcar Nos. 19 to 33. 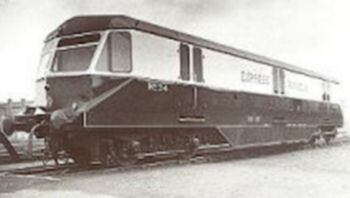 Mechanically identical to the other cars in this batch, number 34 was fitted out the same as the first expess parcels car, number 17, except that access was provided by double-hinged doors instead of sliding doors. Operating from Southall, the cars trailer hauling capacity increased its usefulness over number 17. Specifications of GWR Railcar No. 34. Twin-sets numbers 35 to 38. The final railcars of the Great Western series were operated as twin-coupled railcar units, the forerunner of todays diesel multiple units. With the driving compartments situated at the outer ends of the set, buffet and toilet facilities could be provided for 104 seated passengers. 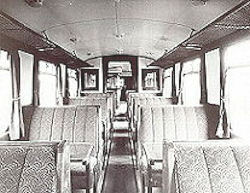 However, if a standard corridor coach was installed between the two cars, seating numbers could be increased to 184. Constructed at Swindon, the cars were indentical in detail to the 19 - 33 series with the same AEC 6-cylinder engine of 105 bhp, giving a total of 420bhp per set. Introduced in November 1941, numbers 35 and 36 worked the Birmingham to Cardiff express service, but such was the demand for this working even with the additional coach, the railcars were replaced by steam-hauled trains except during mid-week. Numbers 37 and 38 arrived during February 1942, but number 37 was heavily damaged by fire on the 17th of February 1947, eventually being condemned on the 10th of September 1949. 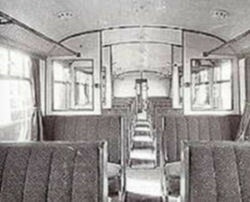 Railcar number 33 was therefore rebuilt in March 1954 with a single driving compartment for use with number 38. Specifications of GWR Twin-sets, numbers 35 & 36 and 37 & 38.